It’s the second most popular pain reliever in Germany after aspirin – yet it’s almost unknown in the U.S.
And I got rid of a 20-year spastic colon problem! Does it sound incredible that one supplement can help all these diseases – and more? Then ask yourself this: What if you had NO vitamins in your diet – none at all? You’d be very sick. Guess what: this nutrient is just as important as vitamins and you’re getting approximately ZERO. If you take antioxidants, vitamins, and minerals you’re only getting it half-right. A new class of nutrients is just as important – maybe MORE important. In five or ten years most people will be taking these nutrients right along with vitamins and minerals. Yet few are taking them now. These nutrients do not exist in most of the foods sold in health food stores, whether organic or not. Almost any cooking or processing destroys these highly complex molecules. What’s more, all the antioxidants and other supplements you take are half as effective – or worse – if you don’t get THIS nutrient either in your food or in supplement form. So you can look at this letter as a privileged glimpse into the future. By reading this you’re putting yourself at the cutting edge of a nutritional revolution. There’s a huge potential for healing many mystery health problems that have stumped doctors for decades. Heads up for cancer patients! A man with kidney cancer, given 50 days to live, was alive and well 15 years later, thanks to this supplement. A woman with metastatic breast cancer – a “death sentence” – was alive and well 16 years later – thanks to the missing ingredient. These incredible results are a matter of record, published in medical journals by Dr. Nicholas J. Gonzalez, an M.D. in New York City. And how about pancreatic cancer patients who were told they had “no hope”? This natural nutrient outdid chemotherapy by better than a hundred to one! When Dr. Gonzalez began his study of 11 “hopeless” patients, an NIH “expert” told him he’d be lucky if three of them lived more than a year. Cancer of the pancreas is usually fatal – and fast. So what happened? NINE of the patients in the study lived more than a year and four of them lived more than three years! Meanwhile, out of 126 patients on chemotherapy, NOT EVEN ONE survived for two years. No one else will tell you this, but the soaring cancer rate in our society may be due in part to a specific nutritional deficiency – the lack of this “missing ingredient” in our diets. A hundred years ago, most people were getting enough of this nutrient, but not any more. The lack of this vital nutrient leaves us wide open not only to cancer, but to heart disease, arthritis, allergies, and all kinds of digestive problems. It’s even linked to autism, lupus and multiple sclerosis. You can experience a huge improvement in your health – often overnight – when you add this nutrient to your diet, either in supplement form OR by eating the right foods. This supplement does in weeks what other treatments take months to achieve, according to Dr. J. Valls-Serra of the University of Barcelona. More than nine out of ten patients with blood clot disorders got totally well. Blood clots are the prime cause of heart attacks and strokes – and doctors put millions of people on medications like coumadin and warfarin to thin their blood. Most of these people would get better, faster, if they just added “the Missing Ingredient” to their diet or supplements. In my report, The Missing Ingredient for Good Health I’ll show you study after study that confirms the heart and circulation benefits you can experience by taking this supplement. Very few American doctors know about these studies because they were published in German and have never been translated. That means your doctor – and you – are missing an important new discovery about the so-called diseases of aging. You can help reverse the so-called “diseases of aging” by correcting a nutritional deficiency. More than nine out of ten patients with inflamed blood vessels improve when they take this nutrient, and most of them get totally well. And what’s the most common complaint as we get older? It’s probably pain. Many “experts” call the most common kind of arthritis – osteoarthritis – a “wear and tear” disease. According to them, our joints wear out and we just have to live with it. 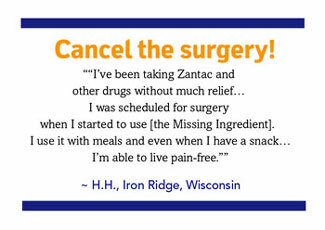 In study after study, patients find the missing nutrient is more powerful than prescription pain relievers. Not only do osteoarthritis patients get better, but in a group of 1,004 rheumatoid arthritis patients, nine out of ten got better when they took the “Missing Ingredient.” As you may know, rheumatoid arthritis is far more serious than osteoarthritis – and all but incurable. Or that’s what they tell you. Don’t believe it. There IS hope. Young people with pain can benefit, too. Controlled scientific studies show that injured athletes heal and get back on the field in less than half the time of those on a placebo. The reason is that the missing nutrient doesn’t just mask pain, it heals the injury – the real, underlying cause. Most of these pain studies were done in Germany. In fact, this nutrient is the second most popular pain reliever in Germany after aspirin. German doctors are well aware of the benefits of this nutrient. Yet most American doctors – even alternative doctors – don’t know about it. And most Americans have never heard of it. Eventually the word will get out. But why should you wait? The almost-unknown power of this nutrient might take your health to a whole new level. Within days or weeks – sometimes the first day – you can see miraculous relief from medical problems that have troubled you for years. One woman reports she now has four extra hours a day – hours she used to spend sleeping or too fatigued and mind-fogged to do anything. Digest your food right for the first time in your life. The missing nutrient treats the real, underlying problem. It often cures suffering victims once and for all. Many patients report instant, miraculous relief. Food allergies go away for good and you can eat anything! 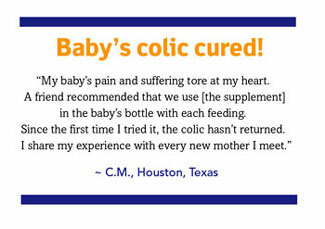 A delighted heartburn victim was able to cancel surgery, and a baby’s colic vanished in one day. I can tell you it’s true from personal experience. I totally cured a spastic colon that troubled me for more than twenty years. Nine out of ten autism cases get better! Our own bodies make these “missing nutrients.” What’s more, they exist in every type of food – BUT ONLY IF THE FOOD HASN’T BEEN COOKED. And that’s the catch. Almost everything we eat is cooked. Even most health foods are cooked. All milk products and store-bought juices are pasteurized. That means they’re heated until these nutrients are destroyed. Food companies process even frozen foods until this nutrient is mostly gone. We’ve almost totally eliminated these essential-to-life nutrients from our diets. As a result, the health of millions of Americans is going downhill faster than an Olympic skier. Wait till you see what happens to animals deprived of this type of nutrient! It’s not pretty. They quickly develop what we call – wrongly – the diseases of aging. Their offspring are even sicker, and the third generation is sterile and half-dead. The Special Report provides the details – the frightening consequences you risk when this nutrient is missing from your diet. 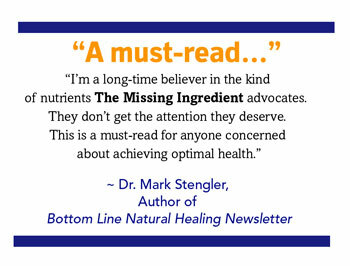 You’ll get complete details on every single fact and claim in this letter when you purchase my new Special Report, The Missing Ingredient for Good Health. As you’ll discover, you can take all the vitamins, minerals, herbal remedies and supplements you want and you still won’t get as well as you should. It’s all because you’re missing this nutrient. In the report, you’ll see case after case where patients took all the supplements from A to zinc and still suffered pain, heart disease, digestive problems and even cancer. When they added the “Missing Ingredient” their symptoms got dramatically better and even completely disappeared. 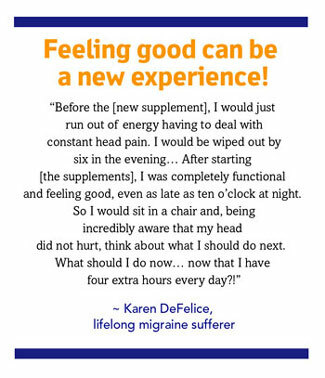 Lifelong migraines, stomach upsets, pain and fatigue often go away almost instantly for people who discover they lack this vital nutrient — and then do something about it. How could alternative doctors overlook this vital nutrient? 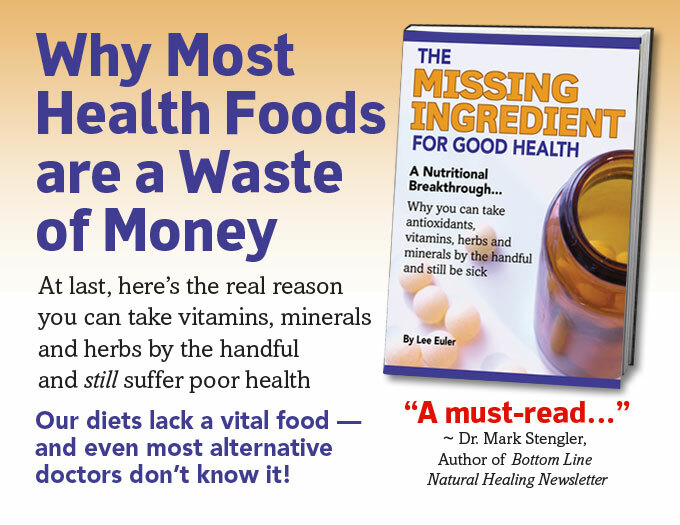 Alternative doctors do recommend “the Missing Ingredient” sometimes, for some health problems. But few alternative doctors put these nutrients on a par with antioxidants, vitamins, minerals and other phytochemicals (nutrients found in plants). Most alternative doctors would tell you “the Missing Ingredient” is a second or third level supplement, something you take “in addition to” the “important” nutrients. And within a few years, they’ll change their minds. You’ll see – but you’ll be there before them. In a few years everyone will supplement with the Missing Ingredient. It’s far more powerful than most doctors know, as you can see from the studies and patients I’ve cited. Those examples are just the tip of iceberg. By the time you finish my Special Report, The Missing Ingredient for Good Health, you’ll be convinced beyond doubt of the overwhelming importance of these nutrients. THINK OF IT: cancer, heart disease, pain…even autism, for crying out loud…are all linked to our poor diets. I stumbled across the Missing Ingredient only because I’ve spent the last several years researching and writing about alternative cancer treatments. My name is Lee Euler. I’m the publisher of a number of Special Reports on alternative cancer treatments, including Natural Cancer Remedies that Work, Cancer Defeated: How Rich and Poor Alike Get Well in Foreign Clinics, and The Oxygen Miracle. 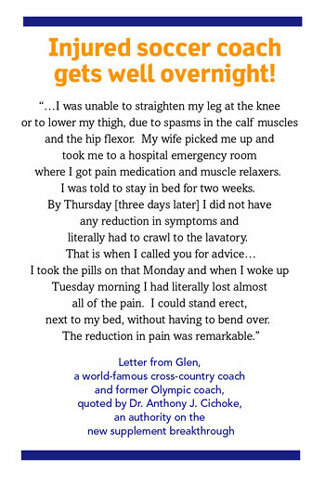 I’ve been writing and publishing alternative health information for more than 15 years, and I thought I’d seen it all. I was wrong. I was shocked to find out that something this important was overlooked by almost everybody. Alternative cancer doctors are just about the one group of people on earth who know the true power of the Missing Ingredient. They’ve achieved remarkable results, but most alternative doctors stay miles away from cancer. They don’t know the latest strides being made in cancer treatment. In America, an alternative doctor can lose his license for treating cancer patients. Few doctors take the risk. It’s too bad, because that means they’ve missed this incredible breakthrough. Their tragic oversight could cost you your good health and your life, because the Missing Ingredient is effective not only against cancer but also heart disease, pain, arthritis, digestive problems, allergies, MS, lupus and more! In other words, intimidation by America’s cancer police has caused most alternative doctors – of all people – to miss a nutritional revolution! Cancer doctors have discovered that the food the patient eats is critical to successful cancer treatment. What’s more, the diets that cancer doctors recommend have one big ingredient in common. It’s a nutrient that’s NOT found in cooked food – ONLY in raw food. But it’s not my intention to nag you about getting four servings of vegetables or five servings of fruit or whatever. That’s wonderful to do, but you can get this nutrient in a pill or capsule. Actually, you can find the most amazing benefits in autistic children when they start to take the Missing Ingredient. The results – detailed in my Special Report The Missing Ingredient for Good Health – will make your eyes pop right out of your head. The proof is clear and undeniable. You’ll see. And if you know a family with an autistic child, you’ll give them this Special Report and beg them to read it. As far as that goes, if you know someone with cancer, heart disease, fatigue or pain you’ll do the same thing! You’ll want to tell everyone you know the good news! Cancer doctors use the Missing Ingredient as one of many therapies, but with the autistic children, the incredible improvement was the result of this nutrient and ONLY this nutrient. And the healing that took place was so dramatic no one can deny it. What’s more, the group of children involved was large – 260 kids. And the mother who collected the data was a trained scientist who was unusually careful and rigorous. In other words, the jury is in and the verdict has been rendered: the Missing Ingredient can change your life and save your life. Let me say this again: I don’t sell these supplements. I don’t make a dime off the pills if the Special Report inspires you to change your life and start taking them. My only business is spreading this important information. Only two or three books have been published about this nutrient. They went almost unnoticed. And as I said, most alternative doctors have missed this critical news. That means my Special Report, The Missing Ingredient for Good Health, is the first publication to pull all facts and proof together into one place in a way that will leave you in no doubt that your current diet and supplements aren’t enough. …because you’re missing a vital nutrient that no one can do without if they want to enjoy full health and prevent diseases like cancer, heart disease, stroke, arthritis, fatigue, and more. Even in alternative medicine, it’s rare for experts to be able to say a remedy is perfectly safe. But I can say it now: the “Missing Ingredient” is safe – totally. These natural nutrients are found in almost every type of food PLUS your own body makes them itself (but our bodies make less and less as we get older). Even the FDA classifies them as a food. It’s almost inconceivable you could harm yourself by taking these nutrients in pills or capsules. In animal experiments the little critters have been fed the equivalent (for a human) of 30 pounds of this stuff with no problems at all. How is it possible experts have overlooked the value of The Missing Ingredient for so long? As you just saw, one reason is that most alternative doctors stay away from cancer. What’s more, the whole subject of nutrition is still in its infancy. Life Extension, the breakthrough book about antioxidants, was published only 25 years ago. This is new stuff. Almost every year, researchers find a new chemical in fruits, vegetables, nuts or seeds that can improve health and save lives. If 1492 was the year Columbus stumbled on America, then this is roughly the year 1530 where nutrition is concerned. Who knows where we’ll be in another ten years? Three hundred years ago no one knew what a vitamin was. If you’d said the word “antioxidant” people would have looked at you as if you had two heads. That was back in the age of sail, and thousands of sailors got very sick from a mystery disease if they spent long months at sea. One of the symptoms was that all their teeth would fall out! Bad news! The disease was called scurvy. An English doctor was alert enough to notice that scurvy disappeared totally – and fast! – when the sailors ate fresh citrus fruit. Eventually the Royal Navy required every ship to carry a supply of oranges, lemons or limes to keep the sailors healthy. That’s why the English are called “Limeys” to this day. Now we know that vitamin C was the ingredient in citrus fruit that cured scurvy. Scurvy is what’s called a deficiency disease. It’s caused by the lack of a nutrient our bodies MUST have. If you provide the missing nutrient, you cure the disease. It was a long, long time before scientists discovered vitamins and antioxidants. They just knew there was something in citrus fruit that prevents scurvy and cures the disease if you already have it. We’ve come a long way since vitamin C saved the first Limeys. Yet we still haven’t connected all the dots. With antioxidants and definitely with the Missing Ingredient that you’ll discover in the Special Report, there’s still a lot to learn. Alternative doctors have to do most of the work while the medical establishment persecutes them. The health authorities even send out police with handcuffs to stop alternative doctors from practicing. When you order your personal copy of the Special Report, you’re going to see that the Missing Ingredient often achieves results just as dramatic as those achieved by feeding limes to scurvy victims. I’m talking about overnight cures. The class of nutrients you’ll discover in the Special Report can achieve miracle “magic bullet” results. But you shouldn’t look at them that way. You should look at these nutrients as one of the essentials you need in a lifetime of eating right, along with antioxidants, minerals. . .and things we haven’t discovered yet. In the Special Report The Missing Ingredient for Good Health, you’ll see how this new, overlooked nutrient works hand in hand with antioxidants, minerals and other plant chemicals to fight the degenerative “diseases of old age.” These diseases are seldom found in people who eat right. I’m telling you, alternative cancer doctors have cured many people just by feeding them a diet of raw, uncooked, organic fruits, grains and vegetables. Other cancer doctors achieve the same results with the supplements. My colleagues and I have toured the clinics, talked to the patients, and witnessed the results. And when I say cured, I mean “cured,” not just “delayed death.” My associates and I have met some of these lucky patients or received their emails thanking us for the cancer information we publish in Special Reports like Cancer Defeated and Natural Cancer Remedies that Work. Now, let’s be clear: alternative cancer doctors can’t cure everyone. When it comes to cancer, there’s no 100% sure thing. For one thing, many of the people who come to alternative cancer doctors are too far gone. They’ve waited too long. But alternative cancer doctors do CURE a great many of these people and prolong the lives of others far more effectively than conventional cancer treatments such as chemotherapy. And this remarkable success is partly due to the Missing Ingredient, which you can start taking today as either uncooked food or in the form of supplements available in any health food store. After reading the report, you’ll understand for the first time how good nutrition works. You’ll see WHY more of us are coming down with chronic diseases every year and how EASY it is to turn your health around with good sense – and the new information in The Missing Ingredient for Good Health. You can order The Missing Ingredient for Good Health as a digital download or as a hard copy. Either way, you have a full year to read it, use it, and think it over. If you’re not completely satisfied with the Special Report, just let us know and one of our friendly customer service people will give you a FULL REFUND. No questions asked, no quibbling. Every penny of your money back. AND YOU DON’T HAVE TO RETURN THE REPORT. KEEP IT. Well, as a practical matter you can’t return a digital download. No matter. You don’t have to return the hard copy, either, if you choose to order it. You can still get every penny back. I’m not worried, because very few of our readers ask for a refund. Instead, we get letters thanking us for the life-changing information we’ve provided. There’s no reason to pass by an offer like this. The information is vitally important. Each and every one of us needs this nutrient. We’re not getting it. And frankly, this deficiency is making a lot of people very sick. You owe it to yourself to find out what’s what. 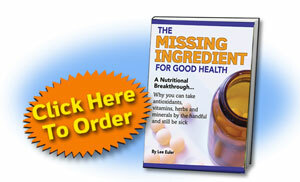 The Special Report The Missing Ingredient for Good Health will set you on your way. P.S. I take “the missing ingredient” myself in supplement form, and the changes in my life have been remarkable. Please, take me up on this risk-free offer and find out for yourself.